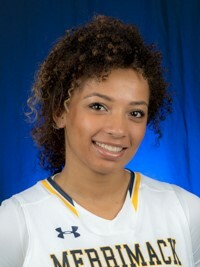 Lexi Martin is a senior guard on the Women’s Basketball team. 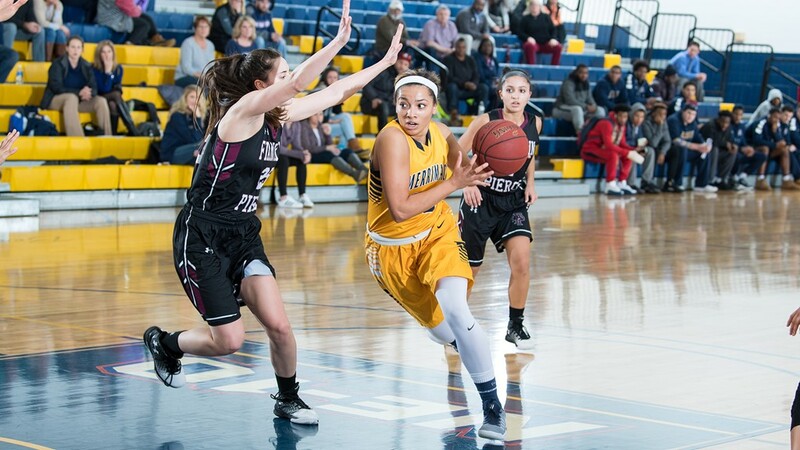 Before coming to Merrimack, she attended Franklin High School in Franklin, Mass., where she was four-year letter winner and two-time Hockomock All-Star. Martin emerged as a contributor on the team during her first year and continued that through sophomore year. She missed the entire 2017-18 season due to an ACL injury, but looks to come back even stronger for the Warriors this season. Martin majors in International Business. My mom got me into basketball when I was little. She started training me and helped coach my travel team growing up. When did you begin to think you could play college basketball? I was actually in eight grade when I realized I could potentially go far with the sport. I realized I was tall and could compete against good competition. I always played against boys and beat them, and girls that were always a few years older than me. I began to get more competitive and played for an AAU team and traveled a lot and played in competitive tournaments where college coaches scouted/recruited at. Well with AAU, the motivation was slightly different. Our motivation was to have fun but to earn a scholarship for a college. So we played games to impress coaches and obviously win games. But here on the college team now, our goal is be the best team in the league. With AAU it was more individual goals, where as here it’s a team goal. And there’s no other feeling than achieving goals and winning games with a team/family. The process of preparing for a game is one of my favorite parts because we struggle, we work hard, we push each other and it’s an area where you need your teammates the most. As much I love receiving support, I also love giving support to my teammates who have the same mission as me. Because when we win, there is no better feeling in the world, than winning with my team. My most frustrating moment was tearing my ACL last season. I was out for the whole year. It definitely took a toll on me since I was a big impact on my team, and I wasn’t going to be able to play and help my team win games and make it far in playoffs. It also was hard for me because I view basketball as a stable and constant part of my life, it affects my happiness my sadness and I use basketball as my “medicine.” I turn to basketball when I’m stressed or going through a lot. It’s a time where I feel happy and relaxed and safe. And my injury stripped that part of my life away and it was the hardest obstacle I have experienced. But it became a huge blessing in disguise, because it opened new doors for me, I realized I am more than just a basketball player. My injury has forced me to find other ways to find happiness and enjoyment. My parents helped me the most, just always supporting me and giving me advice and guiding me through my injury, struggles and hard times. We as a family have a strong faith in God, and my parents would send me daily scriptures just to motivate me in the start of my day which helps as well. If you know me you would know I am a very giving, selfless person. I’m nice but sometimes too nice to people even when they may not deserve it. And especially for the ones I truly love, I will do anything for. But sometimes I may not be fit, mentally able, or even physically able to afford to help out the ones I love. And I frustrate my own self when I feel like I don’t do enough for people. But My dad once told me, “you must take care of yourself until you are are healthy enough to take care of others.”And you can interpret that in multiple ways, but the way I think of it is, I need to put myself first and make sure I’m healthy enough to take care of the ones I love. I also realized I don’t take care of myself enough, and I need to practice self love and express more independency, and be more confident in myself. I seeked happiness through others’ happiness, I find confidence from the compliment I receive from others and come to find out, it was never enough. I should find happiness in the things I do for my own self. I should be confident in the words I say about myself. First, I want to play for as long as I can physically play. Then I want to share my love and my passion for the game with others, especially the young crowd. Start clinics and camps, and even coach my own AAU or high school team in the near future. I most definitely will be keeping basketball in my life for however long I possibly can. Along with owning a huge basketball complex to host games and large tournaments, clinics, camps and more.